Maremma hill towns, villages and hamlets sit proud upon dense oak-wooded hills and massifs in this wild and undiscovered part of Tuscany. At their centres are Etruscan foundations upon which medieval fortresses, castles, and towers still survive intact: as occupied now, as they were centuries ago. Special places with spectacular panoramic views of the surrounding landscape that will take your breath away, they will leave you feeling that time has all but stood still in this part of Italy. Gerfalco in Maremma Grossetana by kind permission of Enzo Tiberi. Way off the Tuscany tour routes - you will be hard pressed to find another English speaking tourist during your visit - they are perfect for the independent traveller seeking an experience of real every day life within the Tuscan countryside. Where men do sit together every day in the shade under trees in the small "piazzi" (sometimes so small, other than for the sign on the wall, you would be forgiven for not recognising it as a "piazza" - town square) engaging conversation with whoever passes by. Where the women do hang out the washing - knickers and undies, the lot! - along pulley-lines between apartments across narrow medieval streets or over tiny balconies... there are no tumble dryers here. Where the local children are known and recognised by the same people who remember the antics of their parents when they were younger, and who grew-up with their grandparents. Families in these towns and villages live in the same homes that their ancestors occupied for centuries, albeit now with gas, electricity and water connected. 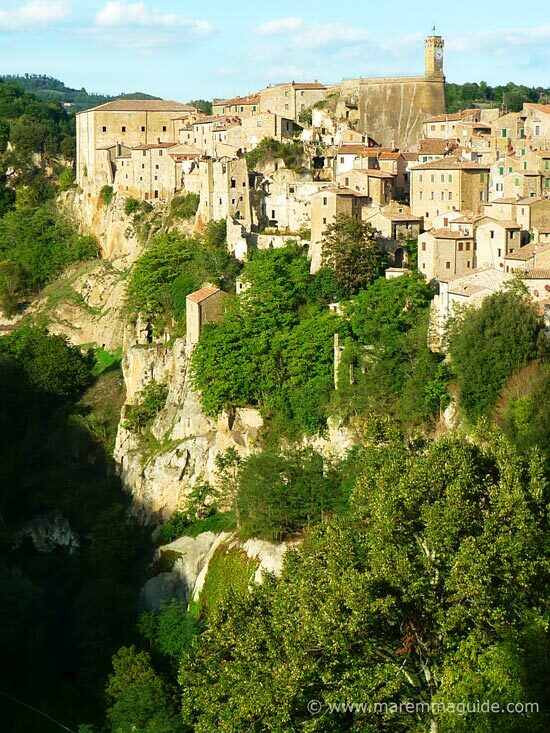 Of all Maremma's hill towns Sorano will capture your immagination like no other. Here, the wonderful, slow pace of everyday life is dominated by the changing seasons. The pruning hard of the vines or olive trees, the tending to the grapes, the harvesting of the abundant summer apricots, cherries, oranges… And then the autumn grapes and olives. The first press of the olive oil in the shared "frantoio". The sagre celebrating the autumnal chestnuts or porcini mushrooms. But a stay in these Tuscan hill towns and villages does not have to be at the expense of visits to the main cultural or tourist centres of Tuscany. Depending where you choose - Maremma is an extensive land - you can be in Siena, Florence, San Gimignano, Volterra, Moteriggioni, Pisa and even Rome, in under an hour. Nor does the tranquility that you will find in these villages and hamlets, so profound that the experience calms your heart and soul - a special thing indeed - have to equate to solitude. Even if you are exploring this wonderful part of Tuscany and Lazio alone. Just strike-up a conversation - a "Buongiorno" will do - and you will be warmly welcomed. Say something else - it doesn't have to be perfect Italian! - and you will be asked if you have seen the beautiful church around the corner? Or if you know that you can go down the mine just outside of the village? An offer will be made to go and fetch the key to the church... Indicate that you are looking for some refreshments and someone will offer to show you the way in person to the only bar in town. A tiny restored medieval hamlet at the top of a single track road on the hill above Suvereto. Once a rival Aldobrandesca fortressed town to the neighbouring hill town of Vetulonia (from which this image was taken), Buriano is home to the lost church of Saint Andrea and the hermitage of Malavalle. It is for the sheer silence and within its walls and that of its castle and the panorama that you should visit. Visit the open wine cellars during the town's autumnal festivities for a unique experience deep beneath a medieval town. 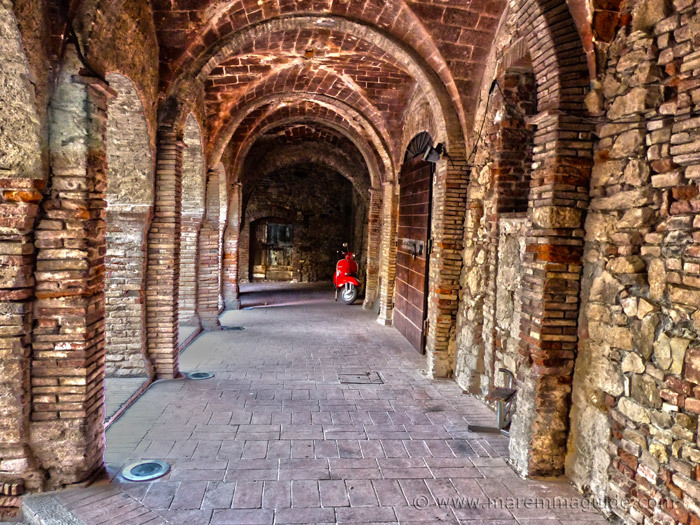 Campiglia Marittima Tuscany: Maremma's medieval city of arches. Be ready to swoon! 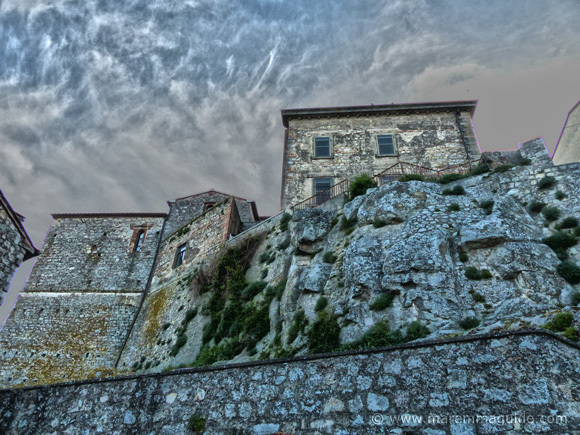 Take a morning or an afternoon to explore this towns many medieval streets, eat a picnic in the gardens of its ruined castle the Rocca Aldobrandesca with museum and stunning views and then visit the Parco Archeominerario di San Silvestro for a day you will never forget. Capalbio Italy, the last fortification between Tuscany and Lazio, is best seen in her winter coat. Close to the Bolgheri vineyards and wineries, a popular place for an aperitivo after a day spent on the beach along the Costa degli Etruschi. Once a rich pyrite mining centre, Gavorrano is a splendid medieval city to explore by foot and home to the annual August festival (the Salto della Contessa) that records the murder in the nearby Castel di Pietra and story of Pia de Tolomei, the international mining museum the Parco minerario naturalistico di Gavorrano and the Teatro delle Rocce. Gerfalco is a traditional hill town situated on the highest peak of Maremma's metalliferous hills and at the foot of the Cornate mountains, with three churches, two towers and two medieval entrance gates. A place of cool respite from the summer coastal heat. Giuncarico is a Tuscan hill town in need of a little love and attention, with sweeping panoramic views across the plain of the River Bruna. Lovely La Leccia sitting above the Valle del Diavolo - the valley of the devil. Tiny it may be, but it packs a punch in medieval history, a legend and not to mention a miracle or two! The tiny castled medieval hamlet of Lustignano, on the sulphur trail in Maremma in a landscape of spitting black mud pools and hissing stinky vapour outlets!, has a habit of unveiling ancient treasures to the world! One of the better known Tuscan hill towns in Maremma, its encircling walls of are its most impressive feature. The video. Don't miss nearby ruins of the Monastero di San Bruzio. Massa Marittima is a spectacular medieval and Renaissance city and one of my very favourite places in Maremma. Of all the wonderful places to visit in Maremma, this one is not to be missed, especially for lovers of costumed medieval festivals and archery. Montegiovi will catch your imagination from your very first glimpse from afar and light a quest within you to visit to meet it in person. A romantic quest that has no roots in rhyme or reason, for there are so many other picturesque hill top villages in Maremma beckoning you to visit. But which, nonetheless, you will follow. For you must. Montelaterone is Maremma's Watership Down. It's ups and downs and alleyways that split and connect the concentric streets within this hill town's ancient castled medieval walls, will have you going around in circles. More than once. Send your kids off ahead to explore and they will be keeping a frequent eye on you, whilst you won't see them! have fun! 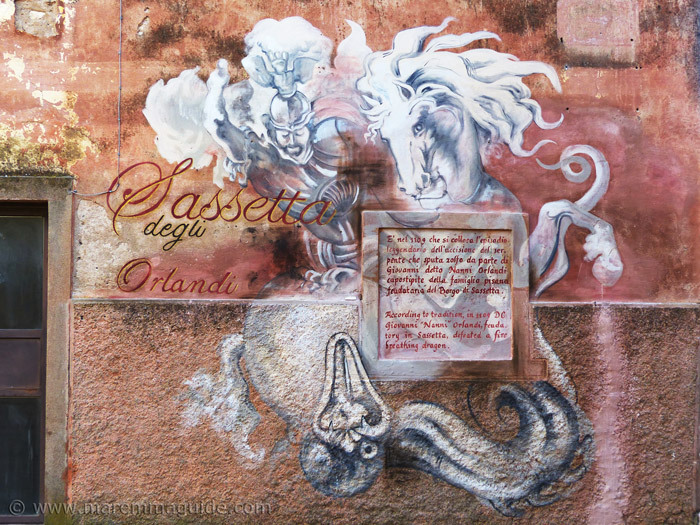 A small and very quiet medieval town dominated by its castle, the Castello di Montemassi: both of which appear in the famous 1328 fresco of "Guidoriccio da Fogliano". Montemassi is a lovely "slow travel" place to visit. But it is for its unique cat flap, a hole in a wall, and a great Italian salad eaten with locals that you should visit! Set within dense woodlands, until the 1990's Montieri was still the actively mining pyrite, lead and silver from the local hills. Ruled by Volterra bishops for four centuries and with its own silver mint, it is a town especially rich in mining history and changes of ownership. Pereta, a sleepy castled village with Maremma's tallest medieval tower at its centre, has an incredible history of invasion and hardship. Walk through its 14th century gate, up into its 10th century castle and touch the stones of its walls to see if they will tell you what they have witnessed. Pitigliano is probably Maremma's most well known town: sat upon and carved out of a tufa outcrop, it is an incredible place and stunning. Populonia is a pretty little medieval "borgo" enclosed within a fifteenth century fortress and sitting at the highest point of the Monte Massoncello peninsular along Maremma's Costa degli Etruschi. Well away from the regular Tuscany tourist trails, it is here that a prosperous Etruscan civilization built their only city by the sea. Visit and you will understand why. A rural Tuscan town with views to the Gulf of Follonica, sat high in Maremma's metalliferous hills, Prata and the impressive bridge traversing the gorge to reach it, can be seen from nearly everywhere in Maremma Grossetana. With the absence of any shabby corners - in fact it is round - Ravi in Maremma is clearly very much loved by its inhabitants and its tiny tiny still lived in castle is a treasure of a gem. Just be warned! a visit inside by two of you will make it feel crowded! Tuscany doesn't come much more undiscovered than this. Fortified and then some, Roccalbegna was part of the medieval Aldobrandeschi family properties and is dominated by its central "Rocca" around which the town was built. Roccastrada: there is an English saying that, "clothes maketh the man", but in the case of this medieval Maremma hill town it isn't true. It's external facade hides a fascinating history and character you shouldn't miss. 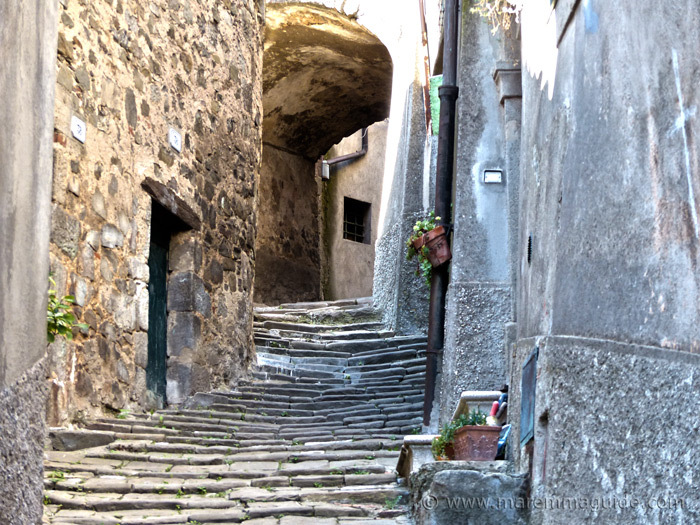 If you are going to visit Roccatederighi - and you should - do so in the summer because something magical happens in its historic heart that will fill your day with surprises at every corner. Bathed in sunshine on a distant hill, Sassa caught my attention and so I drove there to find out more. 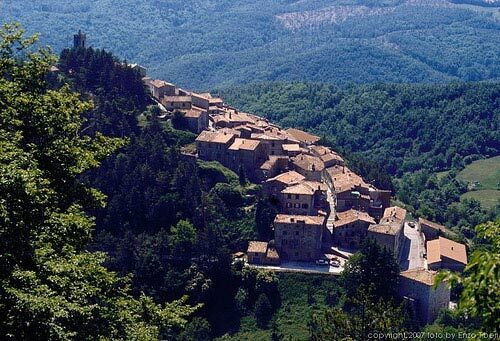 Situated in the Val di Cecina, this hill town in Tuscany not far from Volterra or the coast is fast becoming a ghost of its past with lots of empty properties for sale and restored second homes. A lovely cool retreat set high in woodlands in Maremma Livornese territory, with the hills bedrock protruding in masses between and under its medieval buildings. Although only a short drive from its posh neighbour Castagneto Carducci, Sassetta has none of its pretenses but all of the charm. And it will keep your children amused for a good hour or two - completely for free - for there is so much to see and touch! Home to the hottest natural thermal spring waters in the whole of Tuscany and set in a landscape of hot rocks, Sasso Pisano isn't the prettiest Tuscan town around these parts, but it will delight lovers of medieval history and geology. Scansano is one of those towns in Maremma that when you enter it by car you cannot be sure that you are meant to continue through it along the "main road" that brought you there: for the road narrows to a single lane - it is still two-way traffic! - and no matter what the Italian highway code may say, here, pedestrians rule and you will have to squeeze your way through! Just try it on market day and you will be forgiven for thinking that the access to the car park is in fact the through road! Best time to visit is during the grape festival. The grounds of Scarlino's lovely middle ages castle with its unique combination of three different towers and panoramic views across the river plains and wooded foot hills to the sea and the Gulf of Follonica is one of my favourite places to just sit and stare, or type away writing this guide. And in the town itself below the castle you will find a hoard of gold treasure coins discovered in the ruin of the castles church and a bronze Etruscan monkey... Scarlino. 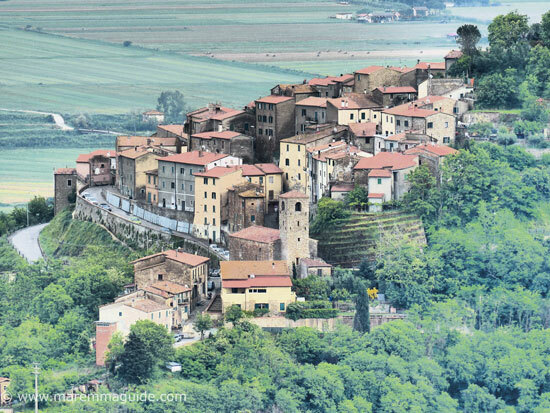 It would be easy to drive past the quiet hill top town of Semproniano. And, in all honestly, with its church bell tower or two and what looks like from a distance to be an ancient bit of old wall here or there, it is like so many others in Maremma. But, just like its counterparts on other hill tops, that little bit of wall has a story to tell. A story that warrants a stop to touch its stones to listen to the tale. And because there is a street tucked up tight within that wall that is veritable box of cotton candies. The kind that will drive a photographer nuts trying to capture its contents because you just can't get all of them in shot! 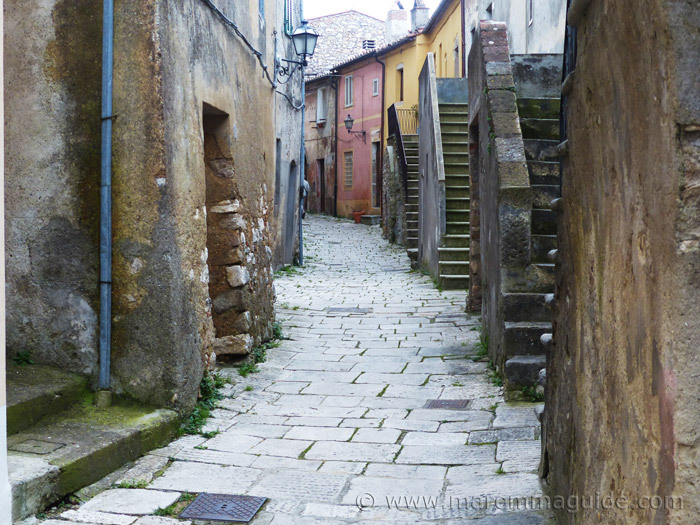 Sorano captured my imagination and stole my heart upon first sight and that is saying something as Maremma is packed full of very special places. Sat precariously on the edge of a tufa outcrop, half crumbling but very much lived in, with shored-up walls, missing buildings, no entry and falling masonry signs, all between medieval palazzo's, churches, shops... and a massive fortress. Not to mention the myriad of medieval alleyways that will make you doubt whether you should continue down them or not. And all around incredible panoramic views of tufa escarpments, glimpses of caves, Etruscan tombs, the sound of rivers and water falls... It is a magical fantasy mix that will have your imagination running. Visit! Sticciano is a tiny hamlet in which time has all but stood still, and the signs at the foot of the hill to reach it tell you that the road is dangerous! Its' not! (other than in extreme winter conditions) and the view across to Roccastrada, Montepescali, Buriano and Guincarico is very special. There are places in Maremma that are more magnificent. Places that will leave your head swooning. And locations that you won't want to leave. In a way that this small hill town just won't. Suvereto offers something that you won't experience anywhere else. Tatti is a wonderful mystery within a medieval castle. The legend of its well will have you returning if you follow it and its incredible number of doors and low passageways will ignite your imagination and leave you wanting to solve its secrets. Tirli sits high up within thick woodland between Follonica and Castiglione della Pescaia and is famous for its dishes of wild boar pasta and stew (although, I have to say the quality can vary from excellent to terrible from one visit to the next). But you should visit! The circular castle at its heart and near vertical alleyways it contains are well worth a discovery. Vetulonia. The lost city of gold here in sleepy backwater Maremma. Hidden under woodland floors and farmers fields for more than seven hundred years. 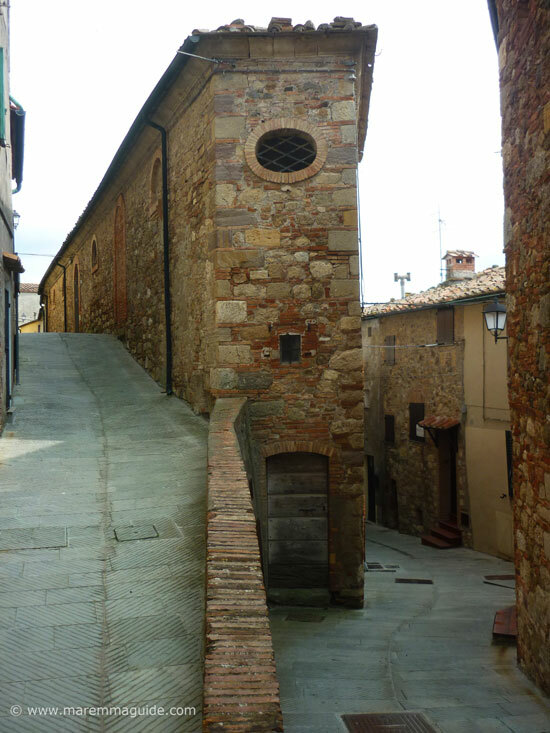 Take a walk along the preserved streets of the capital of Etruscan civilisation, past houses, taverns and shops. Give your children an Indiana Jones adventure in its treasure chest tombs. And then visit its museum - to which locals donated all of the treasures they and their grandfathers had found over centuries whilst working in their olive groves - in which everything that sparkles is gold.